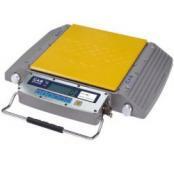 The CAS RW-S and RW-L Wheel Weighing Scale is designed for mobile weight inspection. Connect up to 6 scales for mulit-axle weighing. Ideal for mobile weight inspections and safeguarding against overload weight vehicles. Available in NTEP version. Capacity of 10,000 or 20,000 lb. RW-S weighing platform is 12.2" x 13.4" while the RW-L is 24.6" x 13.4". CAS RW-S and RW-L Portable Wheel Weigh Scales are self-contained, high-capacity digital wheel load scales designed to maximize legal payloads with concern for violations and reduction of maintenance due to overload stress on equipment. The 12" wide platform of the RW-S accomodates single tire (outside tire in dual wheel configuration) while the RW-L large platform accomodates dual wheels and oversized tires. 18 x 21.1 x 2.4in. 28.3 x 22.3 x 2.4in.